Summer sparks adventure, well it does for me anyway. 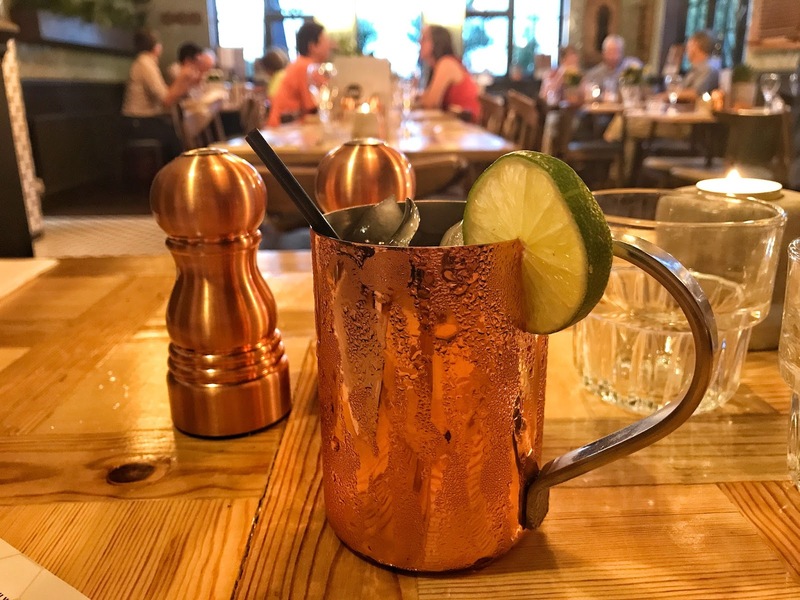 I love nothing more than stumbling on a nice village pub on a bike ride or road trip, God knows there were plenty of pubs that caught my eye on my recent #GOcation. When you’re passing through a village, more often than not a pub has really got to have something about it to entice people to stop for a drink or a bite to eat before they carry on to the next pub. Adam and I regularly walk and jog around Aspley Guise Woods and on a couple of occasions, we have stopped for drinks at The Wheatsheaf in Bow Brickhill. A few Christmases back we even went for dinner there with his folks. There were no complaints but it just lacked that certain je ne sais quoi to encourage us to return. The food wasn’t spectacular and the ambience and decor were bland, to say the least. When I discovered The Wheatsheaf had been recently acquired by Epic Pubs, I was intrigued to try it out for myself. 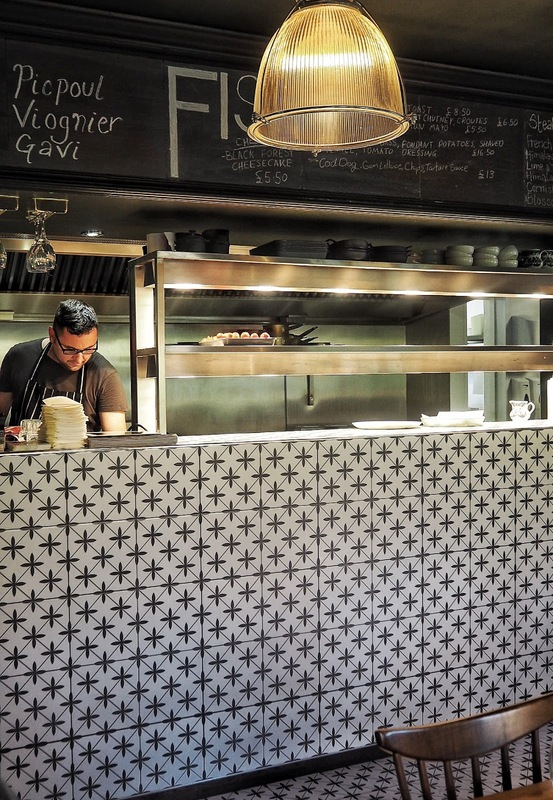 Those of you who read my review of 185 Watling Street will know it ticked all the boxes for me in terms of food, presentation, decor and ambience that I was enamoured by the place and ended up returning within days. 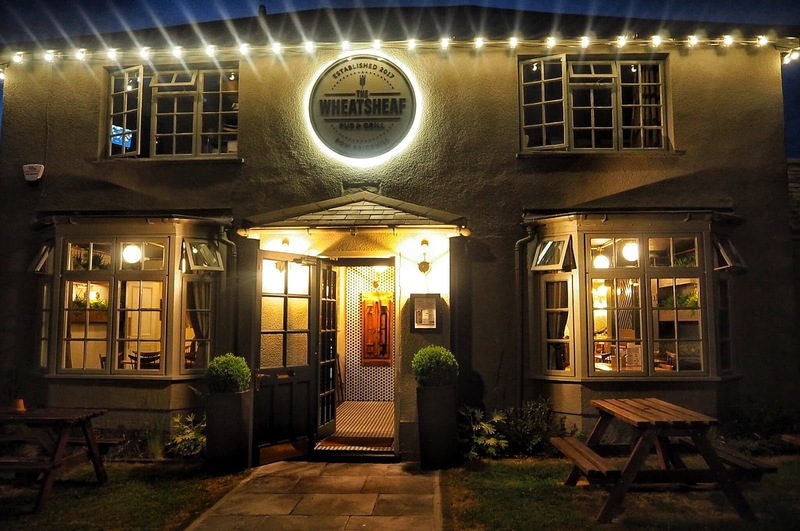 The Wheatsheaf is the latest pub to be acquired by the Epic Pubs group and located closer to home (mine anyway) than 185, therefore I was keen to find out whether it had the same wow factor. I normally drive straight past The Wheatsheaf and always miss the car park, though the newly painted grey exterior makes the pub much more visible from the roadside. 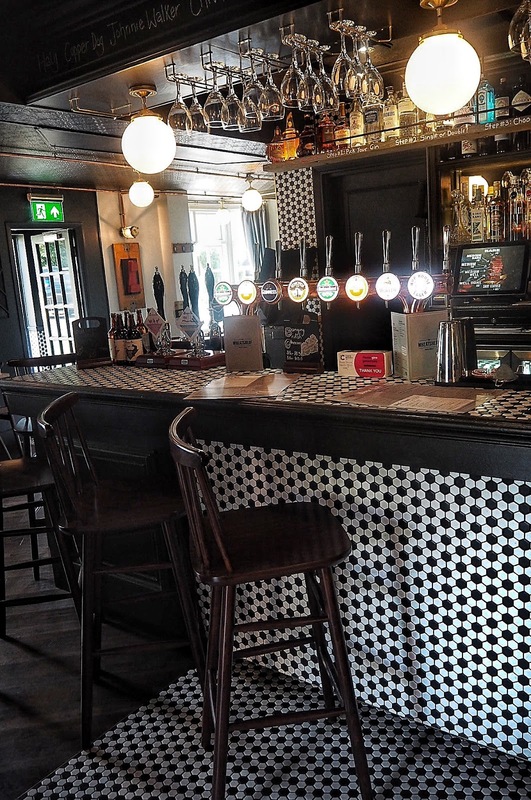 As you walk through the door your eyes can’t help take in the striking monochrome flooring, which is tiled all the way up the bar area. I had merely stepped through the door and was gobsmacked already by the transformation from drab brown carpets to modern monochrome tiling. 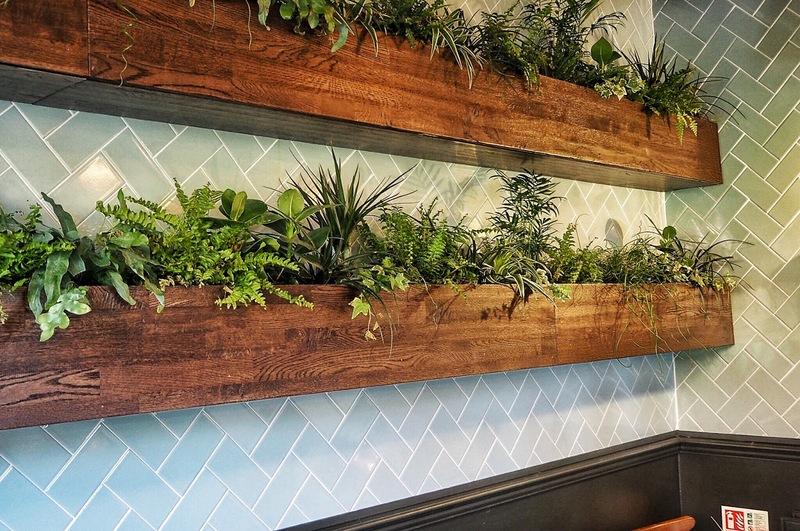 Dark painted walls do not feel closed in due to the white tiles and eye-catching plant boxes attached to the walls. With many village pubs, you can feel like it’s all eyes on you with regulars trying to suss out whether you’re local as soon as you step through the door. Rather like The League of Gentlemen…if you know, you know. 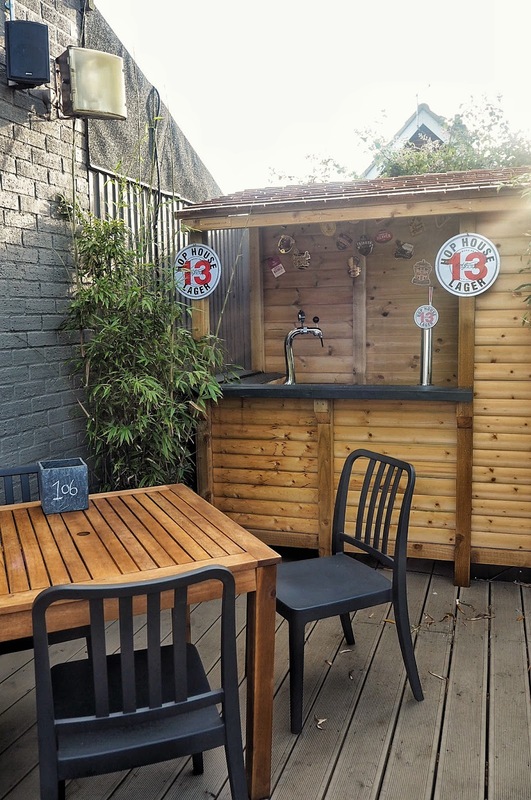 We certainly didn’t get that feeling as we walked through the door to The Wheatsheaf, particularly as barman Nathan and Deputy Manager Alex were both speaking in their native Kiwi accents. It didn’t take much for Alex to convince me to order a cocktail, which coincidentally is one of his specialities as a finalist in last year’s New Zealand cocktail competition. I had kicked myself missing out on 185’s cocktail masterclass at Towcester Racecourse while I was on holiday, therefore I sure as hell wasn’t going to bypass the opportunity to enjoy a cocktail this time. I prefer sweet cocktails myself and found the cocktail list was more on the bitter scale containing many gin-based concoctions. Alex suggested the cocktail of the week The Bees Knees, containing honey, lemon and gin and after way too much deliberation I agreed. In all honesty, I didn’t have high hopes, honey and lemon bring back horrid memories of my dad making me drink it as a child when I had a sore throat and I hadn’t been able to stomach it since. 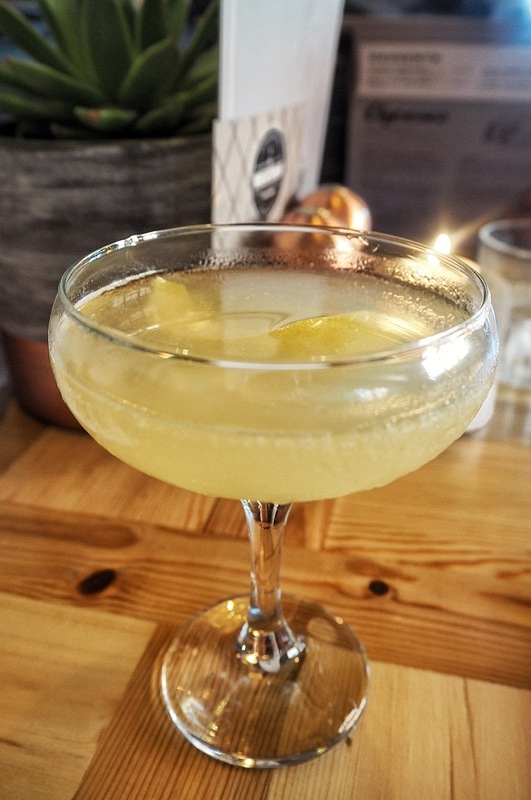 I found myself pleasantly surprised and initial reservations aside, my Bees Knees cocktail went down very easily. It was perfectly blended, no bitty pieces of lemon and it was refreshing without the overbearing sour taste I had been expecting. 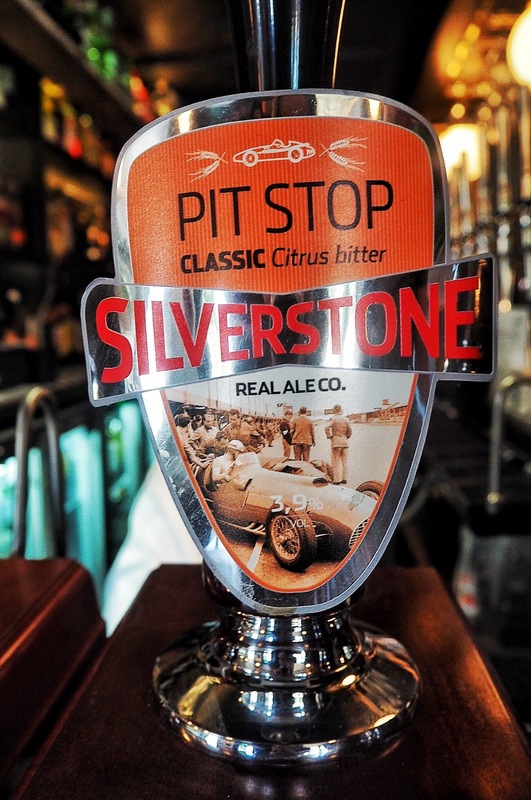 Adam was intrigued by the Silverstone Ales available on tap and we both agreed it was a nice touch for locally sourced ales to be available in the pub. Adam enjoyed his Silverstone Ale, while our waiter Ben showed us to our table. The restaurant is relatively small, giving a more intimate vibe and it wasn’t busy when we arrived at 6.30pm. 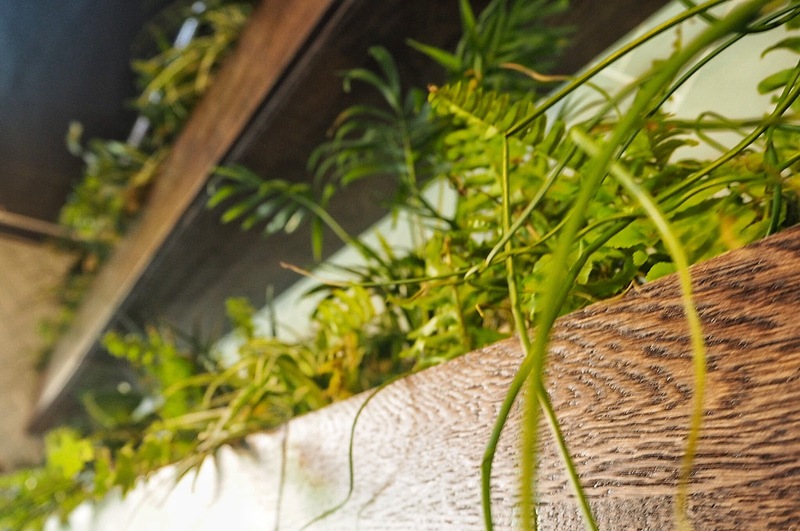 More green window boxes decorated the walls and are a real feature to the restaurant. 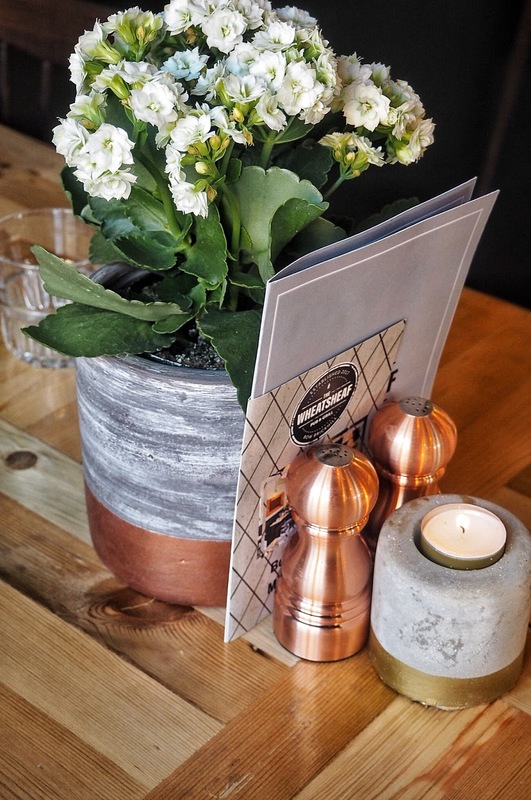 I was particularly taken with the flashes of rose gold on the condiments and it was clear that every little detail right down to the lighting was carefully selected to create the perfect ambience. 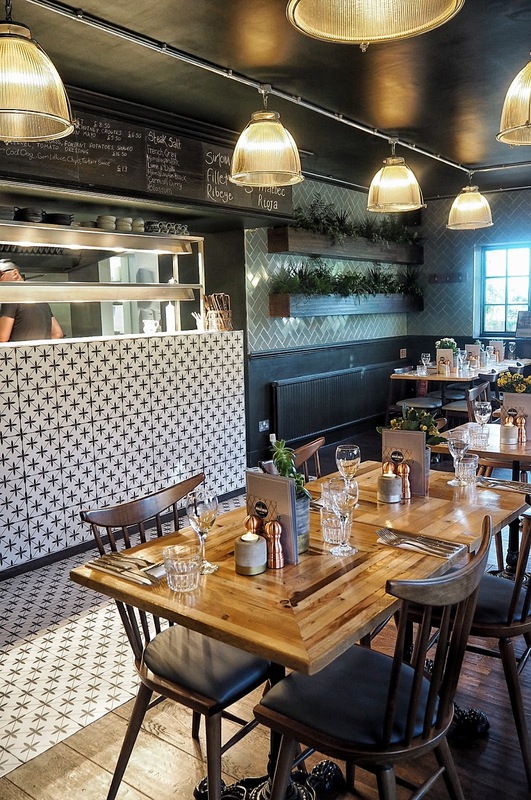 The modern tiling, flashes of rose gold are subtly complimented by rustic wooden flooring and tables to give a relaxed feel to the restaurant in accordance with the village pub setting. Another modern feature is the open kitchen, enabling diners to watch the chef Lewis Moore in action, which was a great opportunity for us to eye up the courses to help us decide what to order. 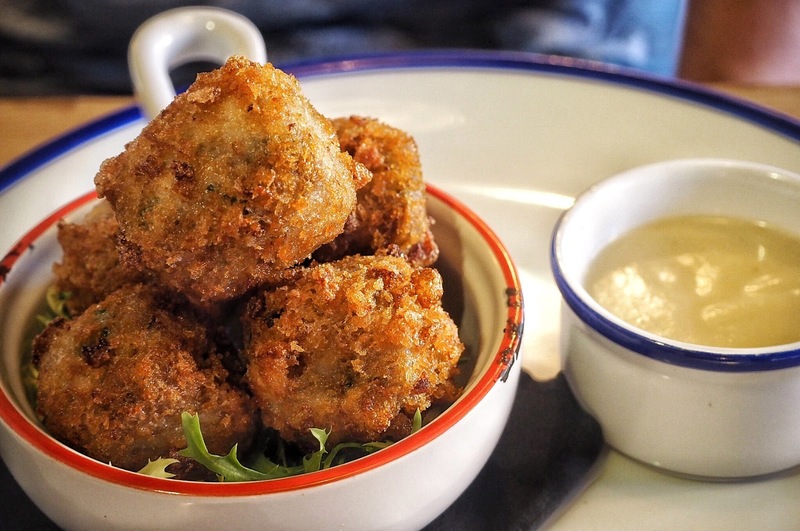 The pork bites instantly caught my eye to start, which to my dismay Adam decided he was going to order. For blog purposes, the importance of ordering various dishes cannot be ignored so I bit my tongue and ordered the potted salmon. To my delight, the salmon starter contained big chunks of salmon, not measly portions I’ve had elsewhere. The dish was accompanied by beetroot chutney and was decorated in watercress, not the type I thing you want to be eating as your waiter approaches the table to ask how the food is, which Ben did right on cue. 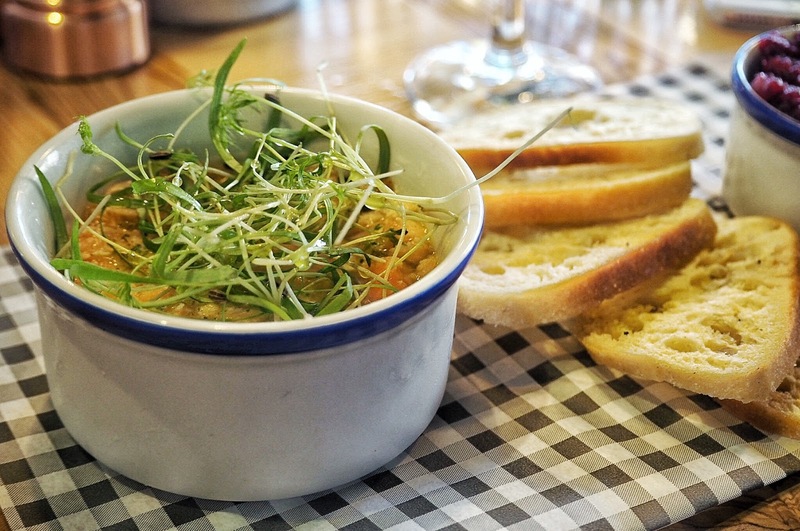 Embarrassing moment aside with a mouth full of greens, I can say I enjoyed the potted salmon; a refreshing summer starter. After claiming the pork bites Adam was not going to share them willingly. As my wide eyes took in the crispy outer coating, he reluctantly agreed for me to taste for myself. 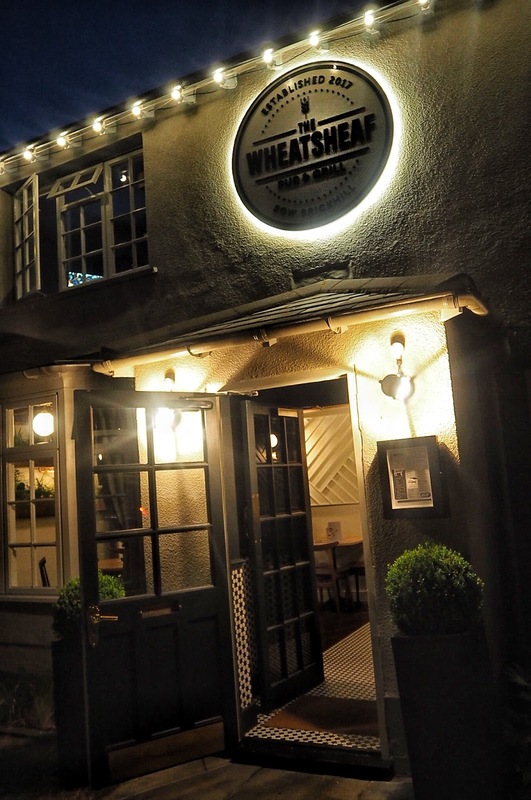 The Wheatsheaf specialises in meat and fish dishes, which coincidentally Adam always orders meat and I will often opt for fish, giving us prime opportunity to test both out for ourselves. I spotted Head Chef, Lewis Moore cooking up my bass and wandered over to the chef’s station (as you do) intrigued by the other dishes. I was particularly taken with the look and presentation of the duck (shown below.) 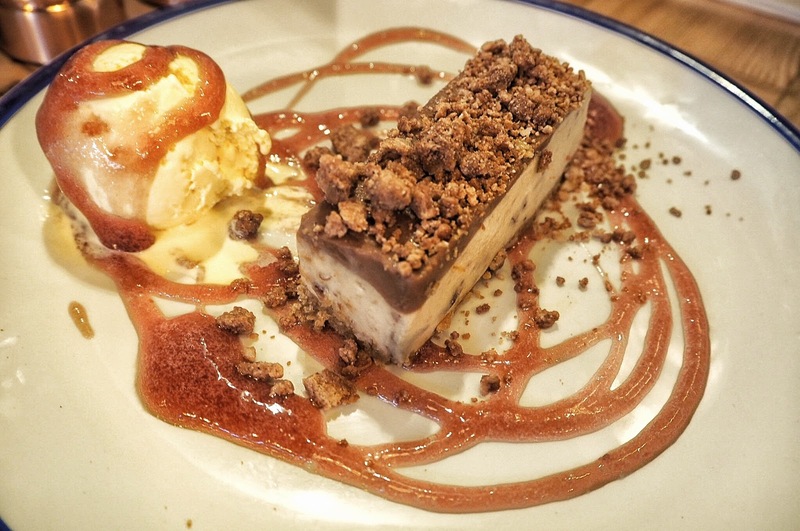 Remarking on this, Lewis told me that the chefs of Epic Pubs have a group messenger where they send each other pictures of their latest concoctions as a means to inspire and motivate each other to create better dishes. 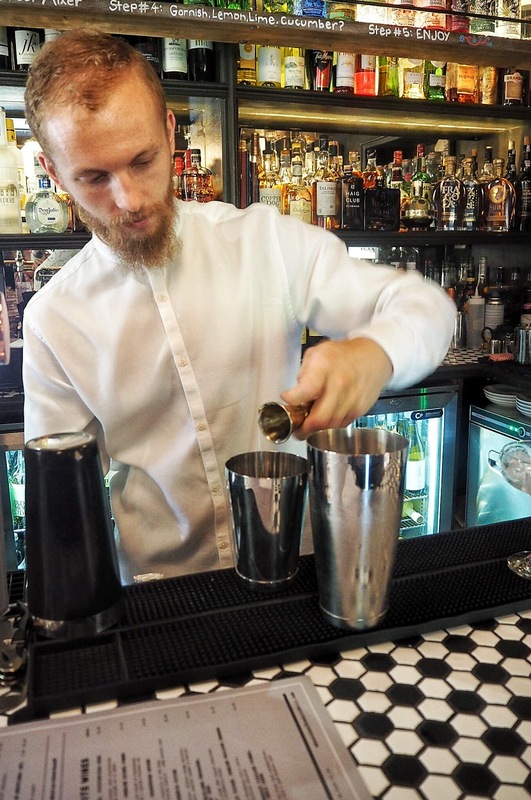 Lewis has worked at The Anchor in Aspley Guise, which I’m yet to try, as well as 185 Watling Street and is enjoying his first Head Chef role at The Wheatsheaf. Adam grinned as Ben arrived with our main courses, which made me smile as he always turns around whenever he sees food coming wherever we go. I had to admit his steak looked damn tasty but I wasn’t going to say that to Adam until I tried my stone bass. The bass was perfectly cooked with a crispy top and pillowing flakes, which tasted yummy with the fondant potatoes. The fish dishes are specials depending on the fresh fish available on the day and other fish dishes available during our visit were crab and avocado on toast and a cod dog! Following the starter, Adam was well aware I’d need to photograph and try his steak (for blog purposes of course). He’d already told me how much he liked the steak, cooked exactly to his liking between medium and well done. As I bit into the succulent steak to my amazement it was full of flavour and was one of the juiciest thick meaty steaks I’d tasted in awhile. 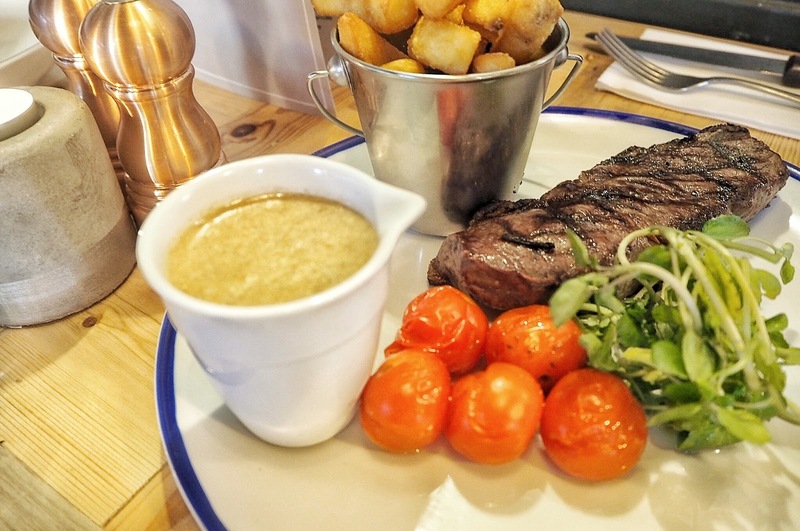 The steak was served with cress and tomatoes on the vine. 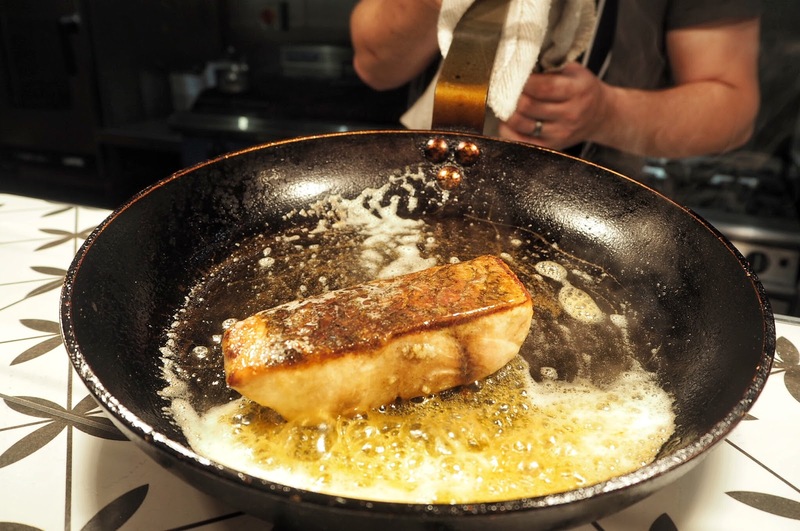 Surprised by the taste of the thick tender steak, I had to admit despite being a restaurant staple it did have the edge over my still enjoyable stone bass. Similarly to the ales, the meat is also sourced locally and is from nearby Woburn Country Foods. Unbeknown to us during our land vs sea dining experience, the restaurant had quickly filled out and waiter Ben was in his element, bursting with energy serving the new influx of customers, which was my cue to order another cocktail. 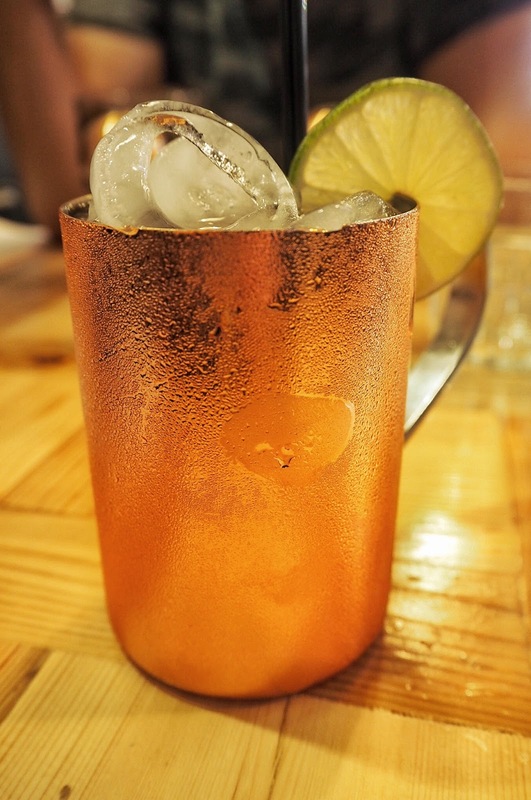 Next up was the Velvet Elvis, served to my delight in a shiny rose gold cup. 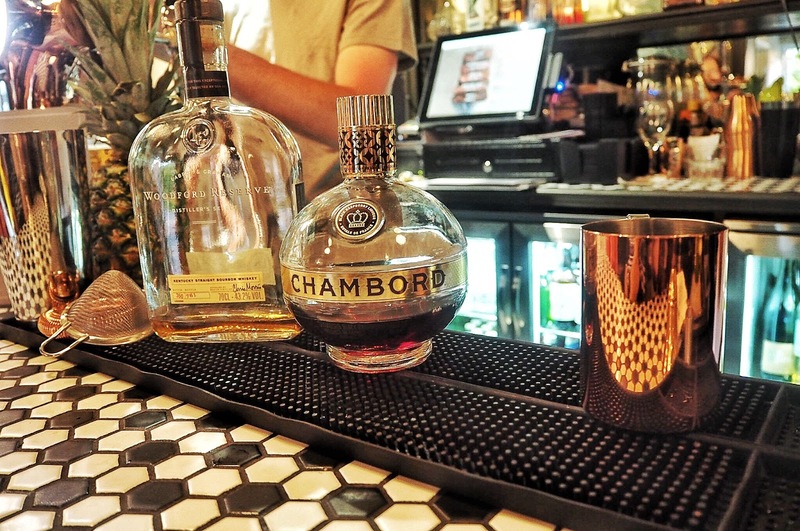 Any cocktail containing Chambord always goes down well with me, how I’d get on with the Woodford Reserve whisky also included was another matter entirely. 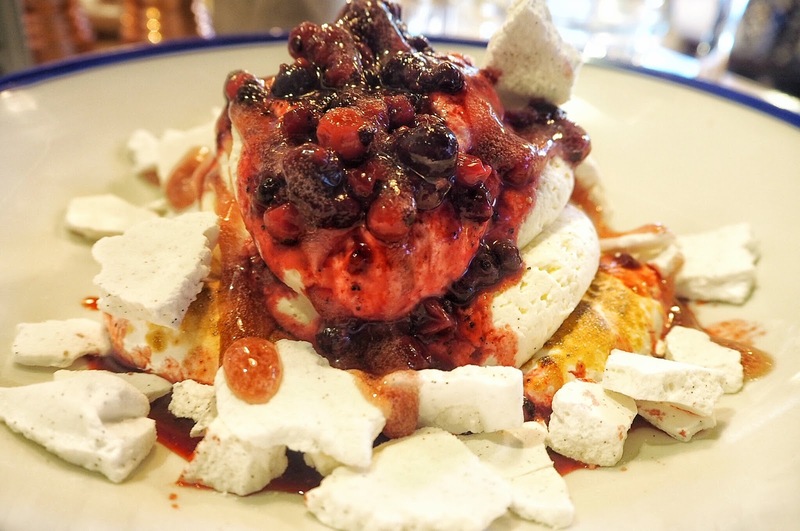 Though, in my defence, this was no ordinary Eton mess and contained gin. More alcohol you’re probably thinking and I was too, after all, it was a school night…Luckily for me, this pink pepper sherbet Eton mess only had the berries soaked in gin, therefore the gin did not overpower the pudding, which may disappoint gin lovers but for me, it was just right. As you can see from the photo below, The Wheatsheaf do not scrimp on their portion sizes and on this rare occasion, Adam was given the go ahead to help me finish it. Only after he finished his forest fruits cheesecake of course, which was another sweetly-satisfying summer pudding. 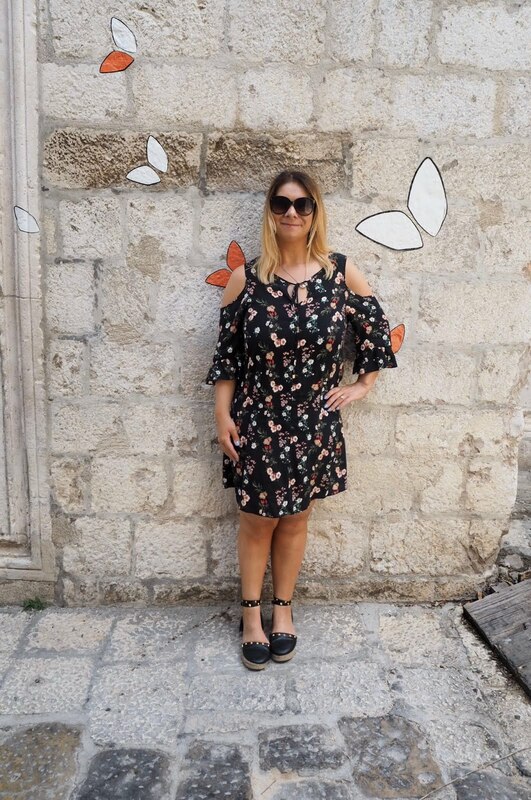 So in terms of cocktails, I was yet to find ‘the one’, though with an appealing outside terrace and open air bar I am more than looking forward to returning to do just that! 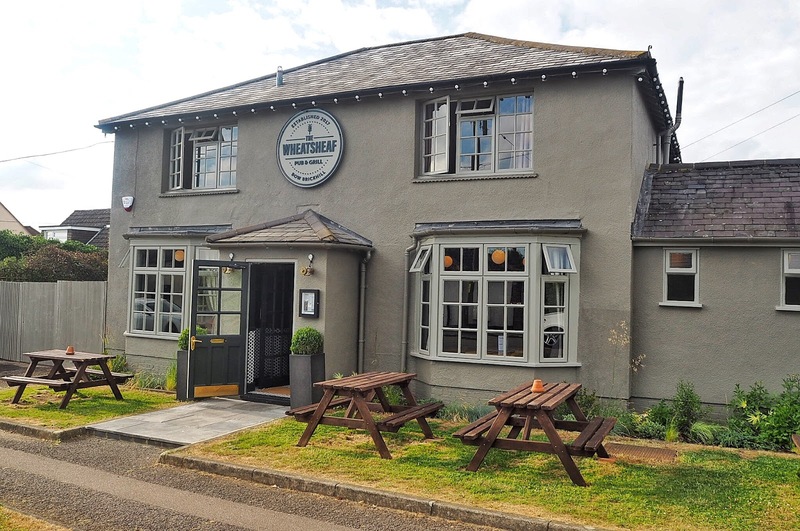 The Wheatsheaf is a great new addition to the Epic Pubs group and is sure to be the pub that those passing through Bow Brickhill will want to visit. I’m only disappointed that they don’t serve breakfast like 185 Watling Street as I’m still craving the unicorn hot chocolate and eggs benedict! 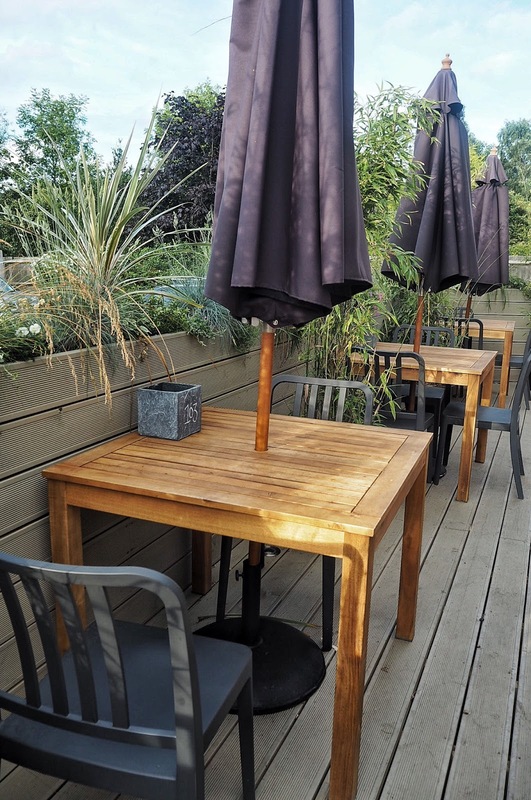 What I love about Epic Pubs is that they consider the whole dining experience and are innovators in the pub market, wowing customers with their decor as well as their food. 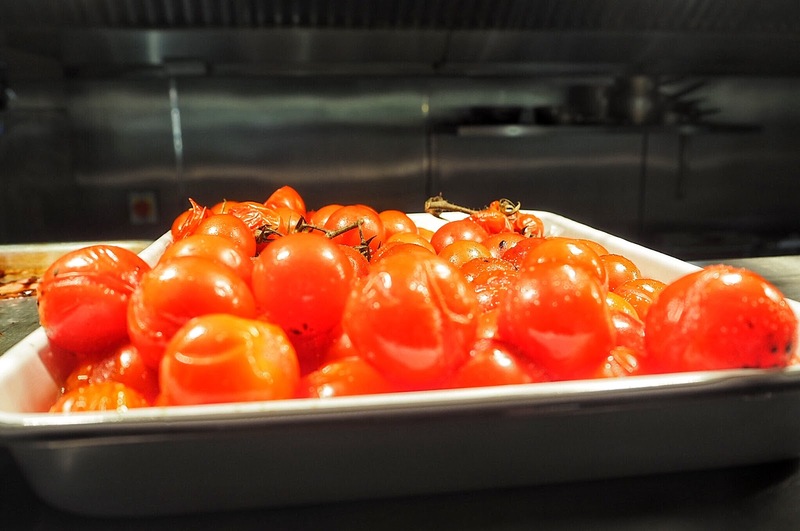 Their frequently changing menus are designed to test the taste buds and events like the six course taster evening I enjoyed at 185 Watling Street add to the social element of dining, which can sometimes be forgotten in the modern world. 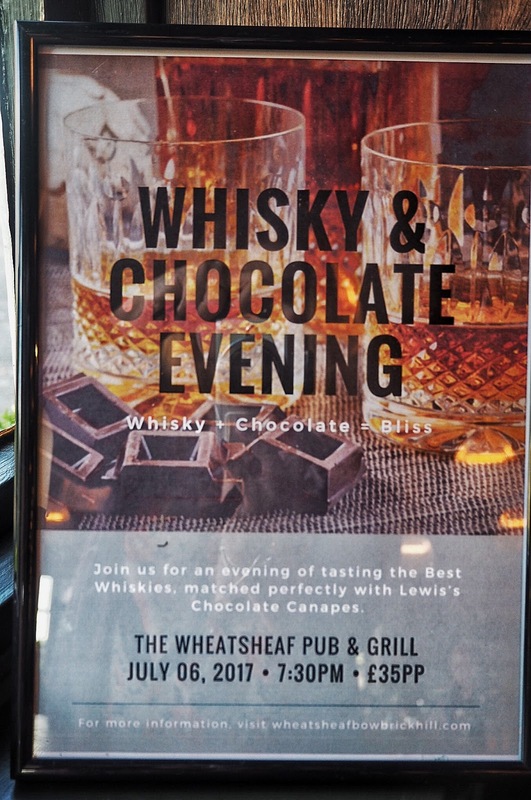 The Wheatsheaf even had a whisky and chocolate tasting evening a few days after my visit. If only I wasn’t still high from the Velvet Elvis…! 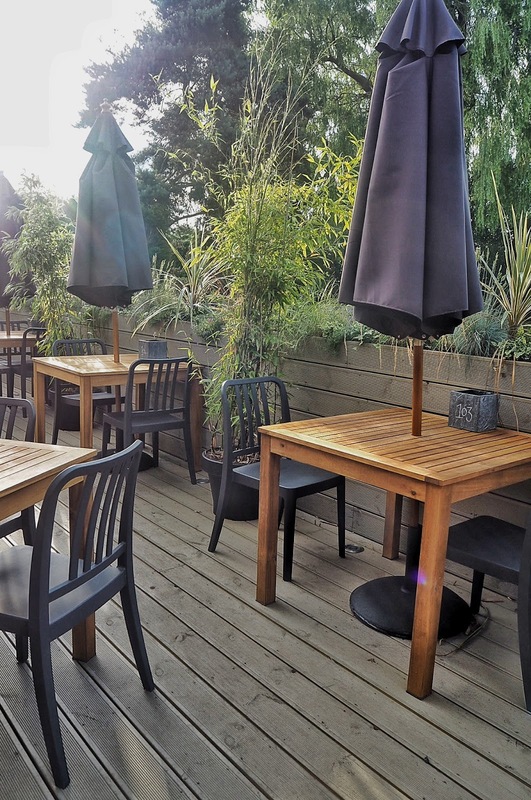 Hats off to Epic Pubs for revitalising The Wheatsheaf and creating an exciting pub scene for locals to enjoy. When it comes to the dining, land vs sea what tickles your taste buds? Let me know in the comments box underneath.